My partner works as a carpenter and he sweats A LOT and requires a good, strong deodorant to keep his body odour at bay. He had the opportunity to try out Burt’s Bees Natural Skin Care for Men Deodorant and see how it performed under hot, sweaty conditions. First let me tell you a bit about this new deodorant from Burt’s Bees. It is a powerful, all-natural deodorant that is made from a blend of essential oils like Citrus, Fir and Cypress to give a fresh, clean smell. It contains Sodium Usnate, naturally derived from the botanical Lichen, which kills icky BO. It goes on smoothly because of the beeswax, coconut oil and sesame oil instead of using propylene glycol as in other types of deodorants. It also does not have any Aluminum Zirconium, a chemical that prevents underarm perspiration in other deodorants. In fact, this deodorant has 100% natural ingredients and is free of petrochemicals and synthetic ingredients. John said that he liked the deodorant’s scent, but found it a bit sticky to apply. It did a good job a at keeping him smelling fresh and clean during the day even on the really hot days. He thought it being all natural was a bonus and said that it worked just as well as his regular brand of deodorant. 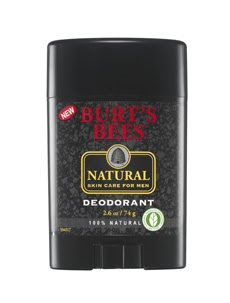 Burt’s Bees Natural Skin Care for Men Deodorant retails for $9.99 and is available this month at specialty, health and drug stores nationwide and at Burt’s Bees website.